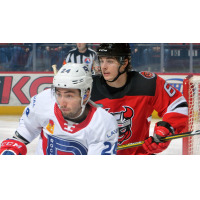 BINGHAMTON - The Binghamton Devils fell into a 3-0 deficit and were unable to come back in an eventual 4-3 loss to the visiting Laval Rocket. With the victory, Laval ended a seven game losing streak. After no scoring for over half of the first period, Alexandre Alain put the Rocket on the board with a rebound goal. Alain lifted the puck up and over goaltender Cam Johnson following the original save to give Laval a 1-0 lead at 12:37 with assists from Xavier Ouellet and Daniel Audette. The Rocket made the Devils pay following a turnover in the defensive zone to jump out to a 2-0 lead. Alexandre Grenier took a turnover and ripped a shot over the left shoulder of Cam Johnson for a two-goal lead, unassisted, at 14:11. Binghamton trailed by two goals after one period and the Rocket had a 13-7 shot advantage. In the second period, Alex Belzille stole the puck from Binghamton's Ryan Murphy and beat Johnson around the left leg pad for a 3-0 lead at 5:33, unassisted. The comeback started on the power play as John Quenneville fired in his 14th of the year from the top of the left wing circle. The goal was assisted by Egor Yakovlev and Murphy with 9:30 left in the second period and the Devils trailed 3-1. Colton White's power-play goal pulled the Devils back within one with just under two seconds left in the second. White held the puck in at the left point and fired a shot off the iron and in for his sixth of the year, unassisted. The Devils trailed by one to start the third period and also trailed in shots 18-13 through 40 minutes. Late in the third period, Johnson came to the bench for the extra attacker and Audette immediately put in the empty-net goal for a 4-2 Rocket lead with 1:12 remaining. Quenneville got one back for Binghamton with just 20 seconds left, but, Laval was able to hang on in the end for a 4-3 victory to end a seven game losing streak. The Binhamton Devils return home tomorrow night in a rematch against the Laval Rocket at 7:05 p.m. It's the annual Heart Cup Game. Come watch Police and Fire Departments battle on the ice at 4:30 p.m. and get a special $16 ticket to the game that night to benefit American Heart Association. Call or text "TICKETS" to 607-722-7367.